In 1441 the Venetians became masters of Ravenna through an act known as dedizione by which the members of Consiglio Generale acknowledged the sovereignty of Venice and in return were granted some rights in the government of the town. 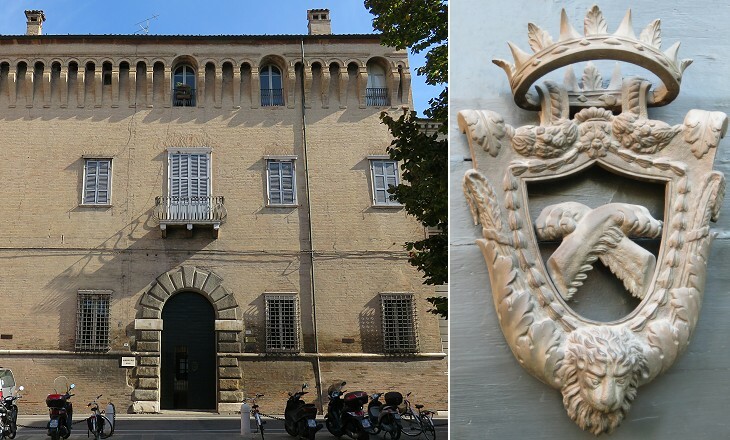 Consiglio Generale was made up of 40/60 members who belonged to the richest families. 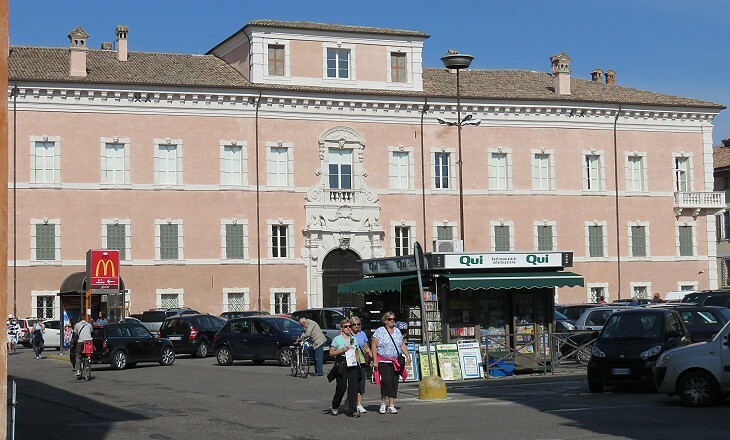 Every four months it elected three members of Consiglio dei Savi, the body in charge of assisting the Venetian Rettore (governor) in the actual administration of the town. Three other members of Consiglio dei Savi were chosen by the Rettore himself. This complex government system required proper facilities to fulfil its duties and Piazza del Popolo retains the palace built by the Venetians (left) and that added by the Popes in the late XVIIth century (right), but modified in 1857 by the addition of medieval battlements. 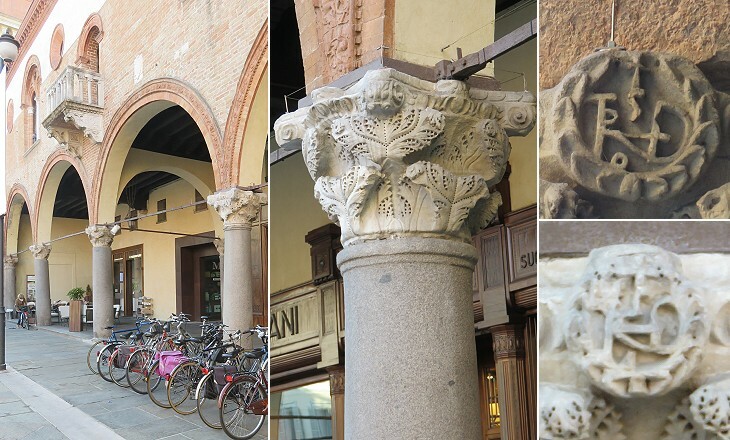 Where the Venetians found the ancient columns and capitals which they employed in the construction of the loggia is not known with certainty. According to Antonio Zirardini who in 1762 wrote the first treatise on the ancient buildings of Ravenna they came from a basilica/tribunal built by King Theodoric in the Forum of the town. Similar to what they had done at St. Mark's Square, in 1483 the Venetians erected two columns in Piazza del Popolo. 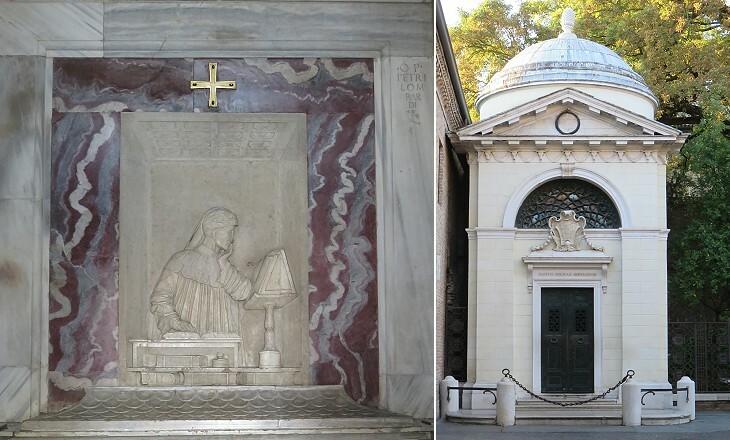 They supported the statues of St. Apollinaris and of a Winged Lion, symbol of the Republic of Venice. 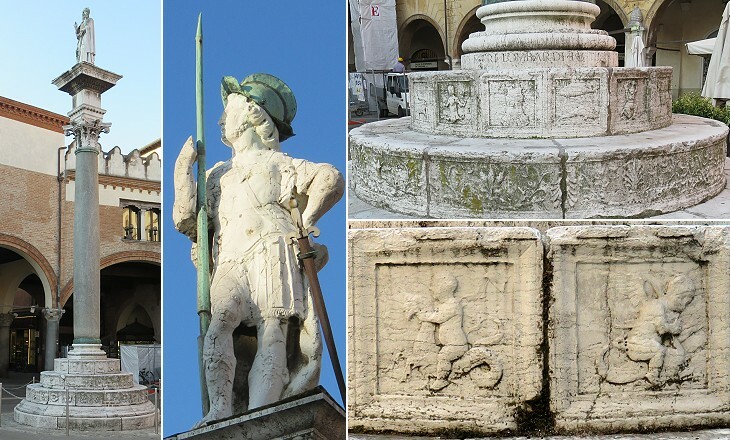 The statues and the fine reliefs which decorate the bases of the columns were made by Pietro Lombardo, a Venetian sculptor and architect. The statue of the Winged Lion was eventually replaced by that portraying St. Vitalis. The weary face of Dante. There was no architecture to speak of; and though there are great many domiciles with aristocratic names they stand cracking and baking in the sun in no very comfortable fashion. H. James. Among the great many domiciles with aristocratic names of Ravenna, those belonging to the Rasponi deserve some attention. They were already among the most important families of the town before the Venetians imposed their rule. They managed to retain prestige and wealth through the centuries by adjusting to the many political changes which occurred at Ravenna. The most imposing Rasponi palace was built towards the end of the XVIIth century by Count Giuseppe Rasponi and his brother Giovanni, Bishop of Forlì, a town south of Ravenna. The palace was completed in 1734 and its architect is unknown. 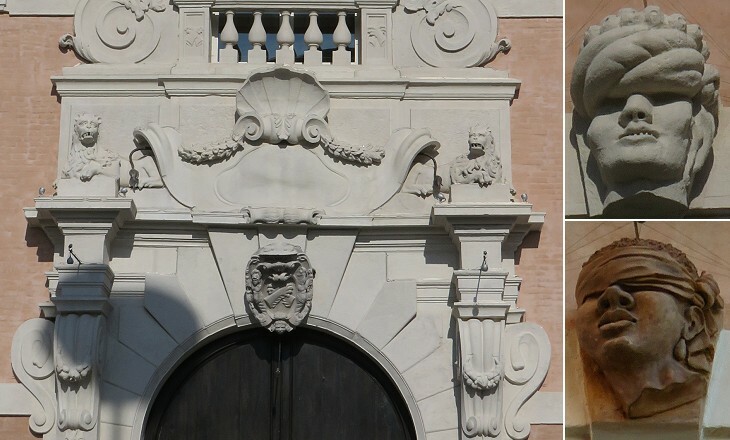 Because of the reliefs showing heads of blindfolded moors it is known as Palazzo Rasponi dalle Teste. A blindfolded moor is a heraldic symbol indicating that a member of the family was involved in a crusade or an expedition against Muslim corsairs. 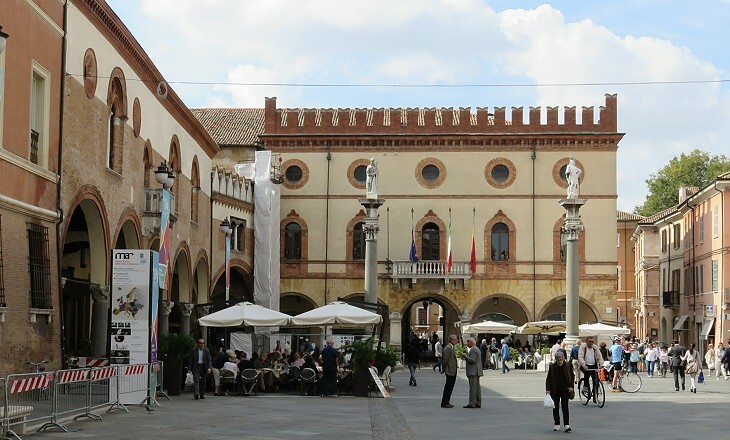 Today Palazzo Rasponi dalle Teste stands in a large modern square, but in the past it was adjoined by a garden of which only a minor section still exists. 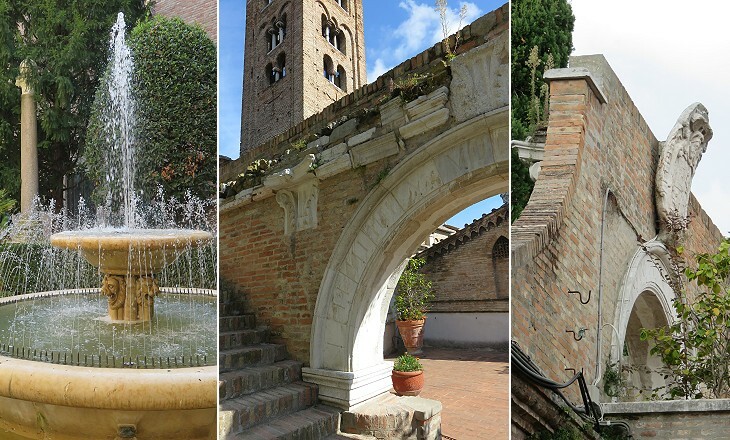 It retains some of its XVIIIth century decoration and in recent years it was turned into a small botanical garden. In 1825 Count Giulio Rasponi married Luisa Giulia Murat, daughter of Joachim Murat, King of Naples in 1808-15, and Caroline Bonaparte, sister of Emperor Napoleon. He added the surname of his wife to his own and the name passed on to the XVth century palace where the couple lived. The Rasponi did not suffer from the end of the Papal State. Count Gioacchino Rasponi Murat was twice Mayor of Ravenna and he was elected member of the Italian Parliament five times. 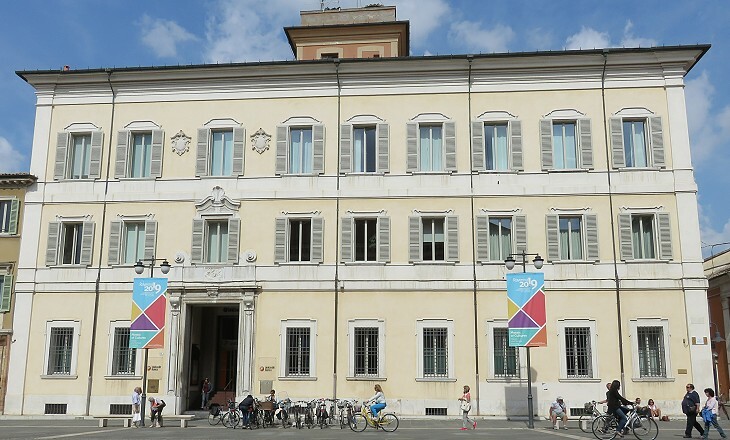 In 1819-20 Lord Byron lived in a former palace of the Rasponi near S. Francesco which had been turned into an inn and was eventually pulled down. It was situated opposite another Rasponi property having a fancy XIXth century Roman/medieval appearance. 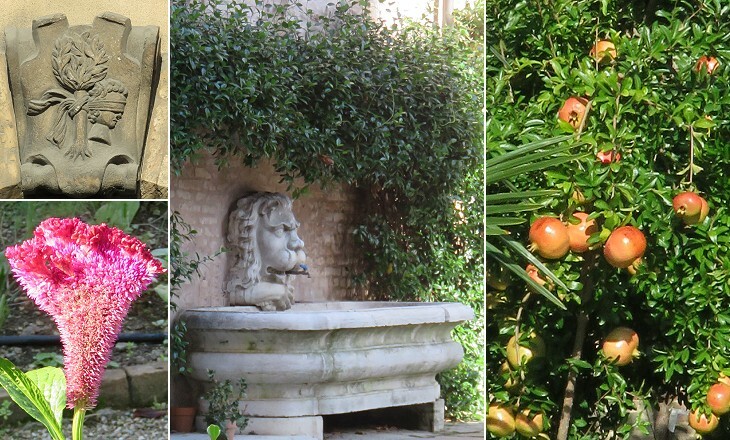 It included a pensive garden and an underground chapel which was decorated with fragments of ancient mosaics. The genealogical tree of the Rasponi shows more than one marriage between the Rasponi and the del Sale, another noble family of Ravenna, but it was only in the XVIIIth century that the del Sale surname was added to his own by a member of the Rasponi family. This branch lived in a large XVIIIth century palace in Piazza del Popolo. Countess Augusta Rasponi del Sale (1864-1942) supported many charities and wrote and illustrated books for children under the pen name of Gugu. 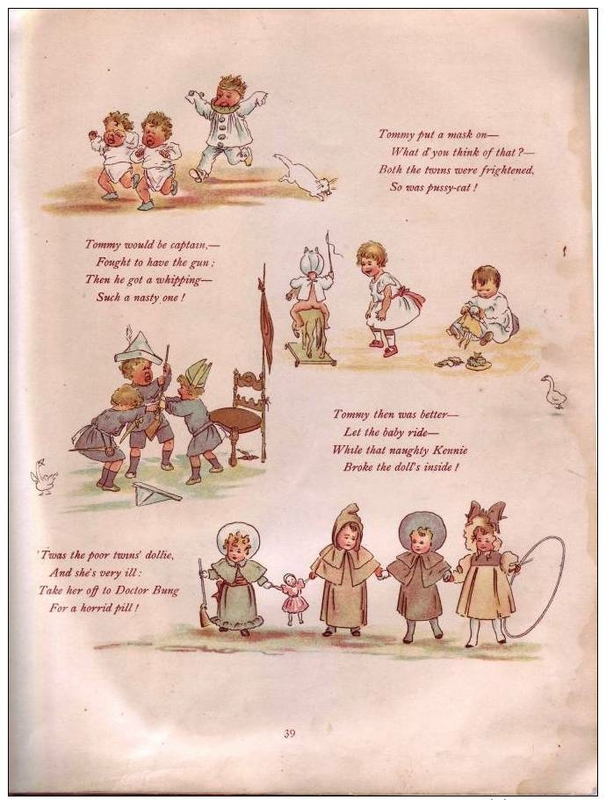 One of them was reviewed by the Sydney Morning Herald (Saturday 16 December 1899) as follows: MOTHER DUCK'S CHILDREN - This charming book for children - published by Mr. William Heinemann in "London 1900" - will be warmly welcomed. It combines agreeable nonsense verses with excellent illustrations. The authorship is ascribed to one "Gugu" who may congratulate herself - or himself - on the production of a book which will be much appreciated in many a nursery. You may wish to see a page of the book - it opens in another window.